Donald Trump held a rally in Lakeland, Florida on Wednesday, addressing thousands of supporters amid the fallout from the Trump tape controversy. The crowd was as enthusiastic as ever, as Trump attacked his opponent Hillary Clinton and the members of his party who are no longer supporting him. As usual, his supporters waved signs and cheered during his big lines -- including once again claiming Clinton is unfit to be president and should be in jail. However, one thing was out of the ordinary: a white woman standing just behind Trump could clearly be seen holding a “Blacks for Trump” sign. 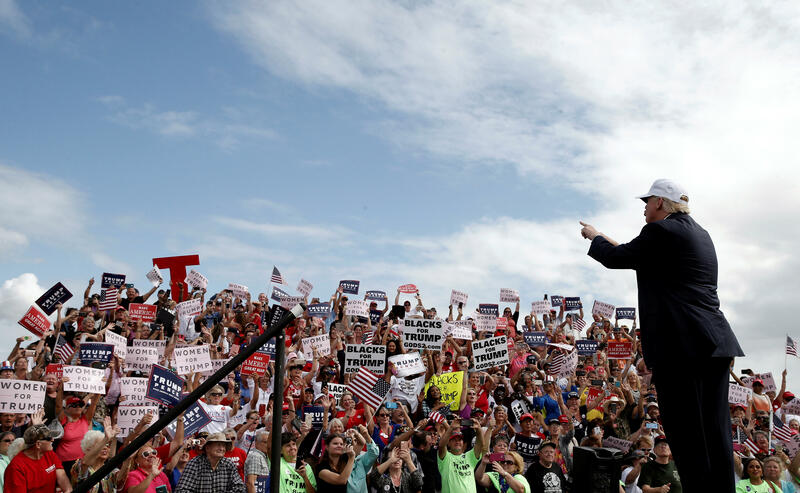 Some CBS News producers noted that these rallies can often be confusing, and signs are usually indiscriminately placed in the stands for attendees to use. And there were signs with several different messages in the crowd. She may have picked up the wrong sign. As such, it’s unclear if the woman was aware she was holding the sign, but viewers definitely took notice.